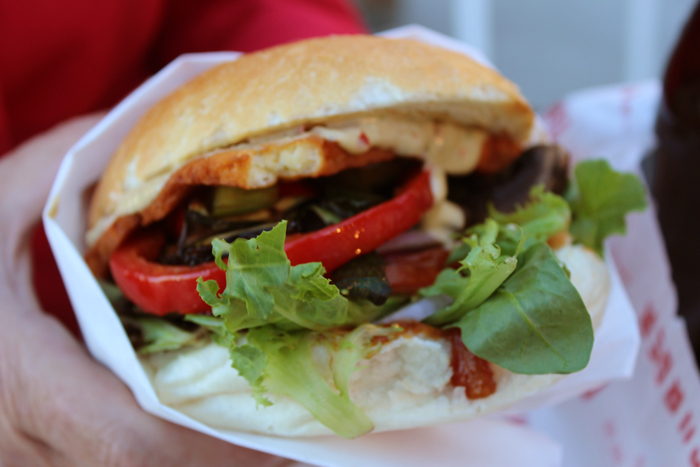 There are many places in Canberra that offer burgers- but hidden away on Mort Street- Burger Hero gives vegans a few delicious options. You can either “build your own” or order off a set menu. The set menu has the “Sweet Vegan” burger which is a sweet potato & couscous patty, lettuce, tomato, spanish onion with dairy free aioli. The “build your own” starts with the same patty, but with options such as roast peppers, beetroot, zuchinni, eggplant, pickles, avocado and dairy free aioli. 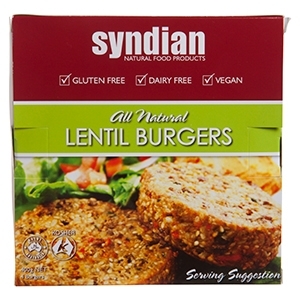 You do need to specify that you’d like a dairy free bun (which is also gluten free). They have both regular and sweet potato fries. Description by Grill’d: For Veg and Veg 2.0’s, we’re meating [hmmm] you more than half way with the Veggie Vitality burger: a beetroot, sweet potato, spinach and quinoa patty, layered with avo, pineapple, carrot and cos lettuce – just coz. You can thank nutritionist Lola Berry for that one, plus a few more in the Loved by Lola menu edit. If you are on a computer, you can read more Vegan ACT group posts about Grill’d here. 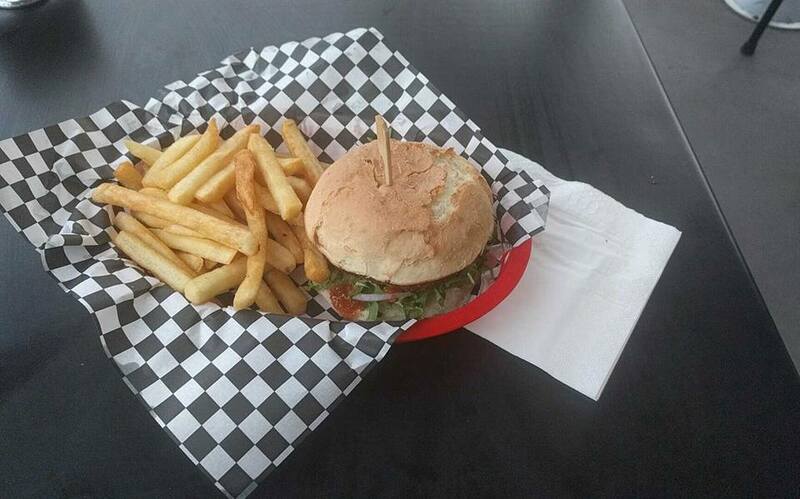 Verdict: We recommend you ask for tomato relish to have in this yummy and very filling burger. We also reckon the avocado and pineapple are key flavours in this burger so if you aren’t a fan of them both then try them with both or get something else :). You also might like to annotate the parts of their paper menus mentioning their ‘ethical’ meat by writing ‘See: aussiefarms.org.au’ then pop them back in the menu box :). It has taken us a while to get around to visiting Brodburger, one of the most widely reviewed and blogged food outlets in Canberra. The buzz was that the vegan burger was pretty good, so we dropped in after visiting the Kingston Bus Depot Markets. Arriving before 12pm meant that our wait was relatively short at 20 minutes. Notably, the burger has no patty as such, just a delicious stack of marinated and grilled vegetables with a spicy sauce and garlicky aioli. Thankfully, as the vegan option is listed on the menu, there is no explaining to do. Just order and enjoy. 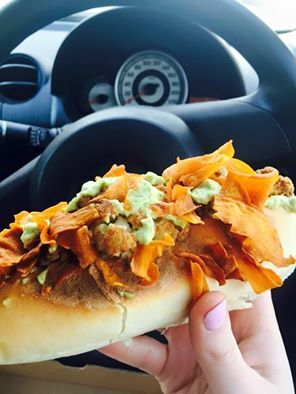 Be sure to order the Vegan version of the Brodveg! Ingredients: flame grilled vegetables (mushroom, eggplant, zucchini, capsicum) with Vegan aioli and tomato relish. You can also get chips with aioli! Comment: Quite tasty and cooks in minutes. Shallow fry. 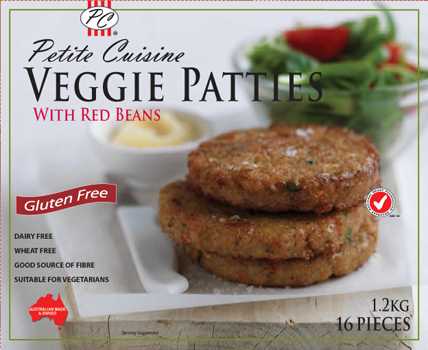 Ingredients: Red kidney beans, capsicum, tomato, cucumber pickle, onion, corn, potato, soy protein, rice, dried orange pulp/unmodified maize starch, coriander flakes, garlic, vegetable booster (caramel colour 150A), pepper. Ingredients: Lentils, brown rice, carrot, sesame seeds, sesame seed paste, onion, rice bran oil, fresh parsley, cumin, coriander seeds, salt. These are eight very pleasant little burgers that are great with salad. Comes with ‘Asian Slaw’ recipe on the back (which I haven’t tried yet). 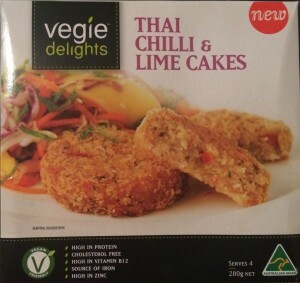 They seem to be so new that not even the Veggie Delights website makes any mention of them. I’ve asked them to look into this. Ingredients: Water, Vegetable Protein (16%) (soy protien, pea protein, soybean meal, wheat gluten), Vegetables (potato, onion, shallots, red capsicum), Vegetable Oils (sunola, canola), Breadcrumbs (wheat flour, salt, yeast, wheat gluten, sugar, canola oil), Oats, Thai Kaffir Lime Seasoning [ dehydrated vegetable protein, parsley, chilli, natural falvour, lime spice extract, natural colour (beetroot)], Flavours, Starch (potato, wheat), Vegetable Gum (carrageenan), Reconstituted Lime Juice (0.4%), Salt, Mineral Salt (potassium chloride), Minerals (zinc, iron), Vitamin B12.